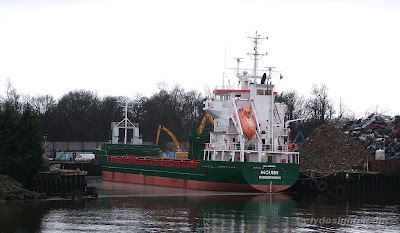 Another ship loading a cargo of scrap metal, this time at the former Lobnitz basin at Renfrew, and also flying the Dutch flag, was the coaster INGUNN, which had recently arrvied from Ayr. This 95.16 metre long ship, which has a deadweight of 5,004 tonnes, illustrates well the complexities of modern shipping - although registered in the Netherlands, where she was completed by the Damen company in 2001, she is owned by a Norwegian firm, and operated by Carisbrooke Shipping who are based in the Isle of Wight. When built she was named MERWEZOON - her name was changed in June 2007 when she was sold to Vaagebulk.